Best Media of the Year: Die Workwear! In a world overflowing with new media, it seems very little of it is any good. Only a handful of publications received more than two votes in our Media of the Year category (part of the inaugural Permanent Style Awards), and of those one was Hodinkee, which doesn't even cover menswear. Several readers also pushed for a 'bad media of the year' category, to punish those publications they saw as selling out and sacrificing all credibility. The out-and-out winner, with more votes than the next five combined, was Die Workwear!, a blog run by American Derek Guy. This surprised me and, perhaps more, Derek. I love Derek's writing, which is well-researched, insightful and eloquent. He also writes regularly and professionally, which is almost as rare. But to win by this margin is striking. There is clearly an appetite for the old-fashioned, personal blog that is knowledgeable but accessible, practical but original. "I think what Derek is doing at Die, Workwear! has been superb. The information as well as the media that he provides to illustrate his points are always on point and relevant. And although I feel that sometimes this world of classic menswear can be a bit snobbish at times, he has always written in a style that is erudite, while still being straightforward." "Best media is undoubtedly Die, Workwear! Derek is a genuine guy, who writes approachable and interesting articles about menswear. He is able to talk about the romanticism surrounding tailoring, while avoiding getting swept up in it. He also has suggestions for less affluent readers when possible." "Derek Guy of Die Workwear, whose writing always conveys his excitement about clothing, and provides a varied palette of ideas and inspiration for what and how to wear things." "Die, Workwear. A unique and satisfying blog not just for the wide sartorial range, but also for the intellectuality, the knowledge of history, and the photography collections." I chatted to Derek last week about the award. Permanent Style: How do you feel about being voted the best media in classic menswear, and by such a margin? Derek Guy: Honestly, very surprised. I think when you create anything online, you wrestle with all the insecurities that come with wondering if something is good enough to put out there. I've never been happy with my own work. I often wish I had more time to polish up the writing or dig deeper into a topic. So, it was genuinely nice (and very surprising) to see some people like my site enough to nominate it. How would you describe the aims of your site, and how you would differentiate yourself from other blogs or media? Most blogs nowadays are very focused. They're about a specific style or approach, or they have a mission in terms of what they want to do for their readers. My site is basically about whatever I happen to be interested in at the moment, and I have very broad taste, which one of the reasons why I was surprised to see my site nominated. I'm just as interested in contemporary ready-to-wear brands as I am in bespoke tailoring. I'd like to think that I write for a similarly minded audience, although I find most people are either interested in capital-f fashion or traditional men's clothing - it's rarely both. I also try to write about classic men's clothing without any of the pretension and class appeal that sometimes surrounds this genre. One of my favourite posts from you is the one titled "I Am Not A Gentleman." I don't care for the moral baiting that sometimes happens in this category, so I try to write about things in a way that shares my enthusiasm without getting into the pretence. Likewise, I try to write about designer clothing and ready-to-wear brands without feeding into the hype of must-haves and celebrity endorsements. I think of my site as being half about quality and how things are made, the other half about design and the simple joy that can be had through clothes. I think fashion should be fun and relevant to people's lives, making them feel better, not worse. There's a lot of stuff out there that feeds into class and social anxiety. And while I admittedly write about expensive things, partly because the things that excites enthusiasts are often expensive, I also try to include more affordable alternatives where I can (this is admittedly easier on my site than yours since I talk about ready-to-wear). Lastly, I try to focus on things I love, rather than things I hate. Again, part of the general view that content is better when it's fun and positive, adding to people's lives and feeling relevant, rather than making them feel worse about themselves, their possessions, or the world. There's enough stuff nowadays to be upset about, things more important than clothing, we don't need to add pants to the list. What principles lie behind what you do? My boss at Put This On, Jesse Thorn, wrote an editorial policy for our site a few years ago and I've stuck with it, even at my own site. It's pretty straightforward. I don't write or publish sponsored posts, or include sponsored content in my posts. I return or donate to charity all review garments. I disclose when I write about an advertiser. And I don't let my business relationships get in the way of my editorial objectivity. I started reading menswear blogs a little over ten years ago, and I try to keep what initially drew me into blogs over magazines. The content was honest, driven by enthusiasm, and there was a clear voice from the writer - things felt personal. I try to maintain that in my writing. How do you feel about the volume of media today, from blogs to brand websites to social media? It's overwhelming, and I sometimes worry there are fewer independent voices. Ten years ago, when I first started reading men's style blogs, there were dozens and dozens of sites. Now, that field had dramatically narrowed. I still read many style blogs, but more and more of them are larger media organizations. It's harder to find those independent voices. I suppose I worry about how much online media nowadays is just driven by branded content or larger companies. Or how much is simply just the "content" side of brand's website, which is obviously organized around selling you products. And how much people's online time is taken up by sites such as Instagram, which rarely goes beyond a photograph. I don't know where online media is going, but I hope there will continue to be space for independent menswear writers who are just talking about things from an enthusiast's point of view. I think there's something special about that category. Some things I've been heartened by: it won't please Permanent Style readers, but I like the new GQ Style site (a separate section from GQ's main page). I think the content there is much better than what many mainstream organizations are doing. I also like many of the podcasts that are coming out, such as Blamo!, which are clearly just for enthusiasts. I'm proud of the work my colleagues create at Put This On, one of the sites I work for. And I like that certain mainstream writers, such as Jacob Gallagher at The Wall Street Journal, are writing from the heart. So long as online media remains genuine and smart, I think that's a good thing. How do you feel about the name of your site? It's absolutely awful. I never thought the site would be seen by more than a couple of friends, and the site's name was partly a friendly jab at a buddy's love for workwear. And, as I'm sure others have noticed, I like workwear a lot more than I used to. You can only imagine how embarrassing it is to email designers asking for quotes. It's like, "Hi, I'm a huge fan of your workwear line and was wondering if I could get a quote from you for my site, Die, Workwear!?" I either have to make a conscious decision to leave off the exclamation point, misspelling my own blog's name, or include it and seem even more schizophrenic. If you include a new category next year for Worst Blog Name, I think I'm more deserving of that award. Nobody really comes close to me in that regard. On the upside, I can't tell you how much spam I've received over the years from actual workwear manufacturers based in Pakistan and China trying to offer me wholesale prices on work uniforms. Things such as actual coveralls, heavy duty gloves, and whatever you'd wear to operate a forklift. It's my punishment, I suppose. I think they think the 'Die' in my blog's name is German for 'The'. Who did you, or would you have, nominated for the other PS awards? For brand of the year, in terms of innovation, I'd nominate Stoffa. They've not only done a lot in terms of bringing a new, slightly more contemporary style to classic men's clothing, but they also have a very interesting business model. While they sell some accessories online, the bulk of the business is in made-to-measure, sold direct to consumers through trunk shows. There's less waste here in terms of inventory, which is great for the environment, and it seems like it's a way forward at a time when brands are both trying to figure out how to escape the problem of commodification, as well as sell things without a robust brick-and-mortar distribution system. There's a lot to Stoffa that I think is just absolutely brilliant in terms of design and business model. For best customer experience of the year, I'd echo those who nominated Skoaktiebolaget and No Man Walks Alone (both advertisers on my site, but also stores I personally patronise). I think the early-20th century model of fashion retailing is dying. Old, huge department stores such as Saks Fifth Avenue used to be famous for their service, but I don't know if they have the expertise anymore to compete against these smaller, more specialized boutiques. To be sure, there are lots of online stores nowadays that offer world class products, but I often find myself going back to Skoak and NMWA for shoes and causalwear. I just find myself relying on them for sizing advice and ideas on how something from their store can be worn. And I trust them, where I may not if I were at a huge department store. For best dressed, I'd go with Bruce Boyer for the inaugural year. There's something special about how little his style has changed. He's always championed the same classic, American style, but worn in a way that feels natural in today's increasingly casual world. It doesn't look like a costume, which admittedly can happen with certain classic clothes. Yet, he always looks terrific - his clothes suit him. Plus, he's an incredibly gracious and kind person, with interests that go beyond clothing. Online, we often think of style as this kind of disembodied thing, so it's about clothes alone. But in reality, so much of this is about personality. For actual, real life style, I think Bruce is great. Thanks Derek, and congratulations. The award is highly deserved. You can follow the discussion on Best Media 2018: ‘Die, Workwear!’ (or, why we need independent voices) by entering your email address in the box below. You will then receive an email every time a new comment is added. These will also contain a link to a page where you can stop the alerts, and remove all of your related data from the site. A deserved win. I enjoy Die Workwear! for the breadth of coverage and how Derek covers RTW with equal respect and consideration. The photo style shots are always well-curated. Kudos too for his policies around conflicts of interest. Interested to know who you thought would win, given that the result surprised you. Obviously a different question to who you think deserved it! No one reads The Rake. What I mean to say (for readers of this site can be so literal-minded sometimes) is that The Rake just tells you the obvious. You learn nothing new by reading it. Nor do you get any critical views on anything. It’s one giant sophisticated Like button. Some of us need to have our views challenged and to see others challenged. The Rake doesn’t do it. That’s why Die Workwear won. Sadly poor editorial, repetition together with all the pimping & preening is seeing ‘The Rake’ off. The concept of a great men’s magazine is yet to be invented. An interesting interview, thank you. Very nice to hear. Found Derek’s blog years ago through Put This On. The writing and the photos are always a pleasure — and an education. Love his answer about the blog’s name. And his line about being positive — “There’s enough stuff nowadays to be upset about … we don’t need to add pants to the list”! If Die, Workwear! had hosted this vote, we all know who would have won. Congratulations, Derek. Proof that nice guys, aided by intense curiosity, taste and determination, can finish first. Richly deserved. Along with Permanent Style, Die Workwear! is one of the blogs I visit daily. The lack of “advertorial” content on both sites is refreshing. Do you hav the list nominees and how many votes they got? I do, but I was planning not to include the full list as once you get beyond the first four or five, you’re into only a couple of votes per nomination, then just one. Feels like that isn’t really statistically meaningful. Interested to know what readers think though. Derek is excellent. His range of interests and depth of knowledge never fails to impress. 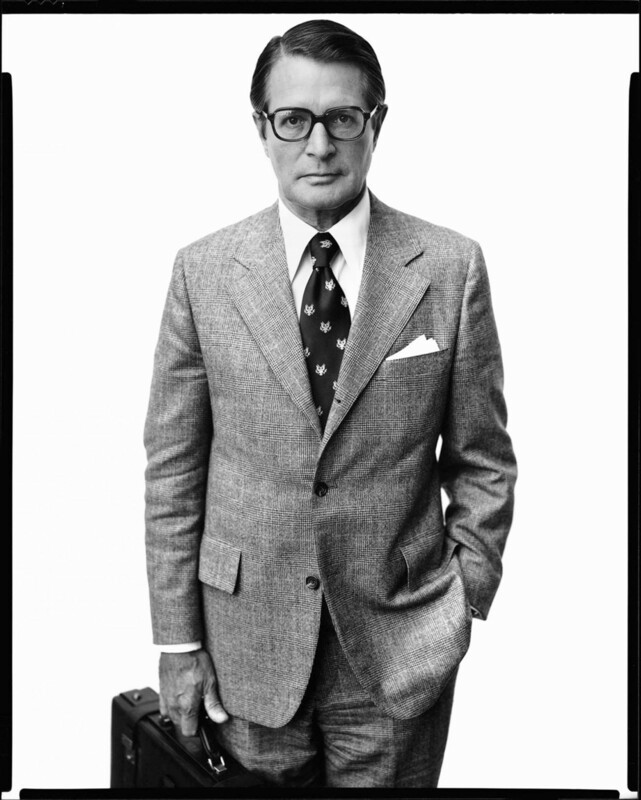 Long time reader of Die, Workwear and great to see Derek win, but the gentleman pictured above in spectacles and briefcase is the American politician Elliot Richardson. What I like about DW and PTO is that they provide intelligent and interesting articles but don’t pretend to be personal style consultants, giving advice about what colour trousers to wear with a particular jacket etc. Derek assumes his readers already have a clue about what to wear and how to wear it. On the subject of ‘Media’ , could there be a lesson for PS here. As much as we may endure articles on £2-4000 shoes many a reader’s persistence to read such articles is stretched by too much of this. As noted even by your recent articles this week your more ‘affordable’ and ‘accessible’ piece articles draw greater interest ( if the Comments are to go on). Yes, give us luxury , but I suspect what draws many of your readers is information around the basics (proportion, affordable pieces , colour coordination etc). Excuse the frankness but as a 7 years and going reader I’ve missed reading articles on PS that I (and my pocket) can relate to. Thanks Robin, and noted. I will always cover the top of the market, often because that’s where I find the most interesting things to write about – where new techniques have room to be fostered and so on. But also things at the affordability level of a Drake’s, for instance. Hopefully that is a nice balance. To answer Robin’s point I am unlikely to invest in the higher end makers of suits, shoes etc but enjoy and just as importantly learn a great deal from Simon’s experiences. Knowing about fit, the manufacturing process, cloth etc as well as what to consider when putting together an outfit is just as invaluable when looking for quality in higher end RTW and MTM as it is in the stratospheric realms that Simon and some contributors have the fortune to inhabit. Good article too, by the way – started to read some of the DW stuff. I don’t agree on this point. 1. I think too many men build too large wardrobes of inferior items they don’t really need, instead of investing in a couple of high quality pieces. This is an issue of philosophy. Seriously – you don’t need 7 suits, 30 shirts, and 7 pairs of shoes. 2 or 3 suits, 10 shirts, and 3-4 pairs of shoes are enough. 2. I am personally not interested in MTM and RTW items and there are a lot of other blogs who cover the MTM and RTW brands (as they are more easily accessible for the blog autors). 3. Even when you can’t afford bespoke, you learn how the object should really look like. And then when you go to the shop you can look for the objects that come as close as possible on fit and make. So covering bespoke shoes and suits also helps the readers interested in RTW and MTM. Die, Workwear! is so different from other blogs. After I read Bill Evans and The Ivy Look I was hooked. The articles are intelligent, well written, and researched. They offer interesting and broader perspectives on clothing and style. They are always backed up by pictures of actual people, instead of people that may have slipped dangerously over the clothing edge. Very well-deserved! I’d often wondered about the name too, as it seemed rather at odds with a lot of the content in it. My only complaint (more of a request really) is the lack of a comments section at DW. One of my favorite things about PS is the comments and the sense of community it generates, despite readers being based all over the world. That said, it must be a Herculean task to manage, and respond to, them all (not to mention the rude and unhelpful ones you endure) so I tip my hat to you for doing this! A well deserved honour! I’m always amazed at how many times I’m circling back to the DW! to see if anything new has been posted. Always a wonderful read. I`d like to see a new category: the best -dressed man ever, my runners-up: Gary Cooper, Gianni Agnelli and Rudolph Valentino.